The Year 10 Travel and Tourism Class of Cambridge International School went to desert safari on Wednesday, 5 February 2014. We went to a desert in the Eastern Region of Sharjah, UAE. 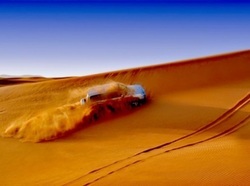 The purpose of the activity is for us to experience the desert safari where most of the tourists go. We rode a car going up and down the sand dunes, saw goats as well as big and small camels. After the ride, we also visited the Arabian Village where I wore a kandura, which is the local dress of the men in the Arab world. Typical Arab music was played and we danced to the music. Arabic food was served but I did not try it as I am not used to it and so I just ate my packed lunch. During lunch, I also had the chance to see a falcon up close. There was a camel at the entrance but I did not try riding on it because I was scared. I also did not try riding a desert bike because I don’t know how to do it. For me, the most exciting part of the trip was the ride in the dunes of the desert where I had so much fun. I loved looking at the sand dunes and its various colours. I hope to have the chance to visit the desert again but this time with my family.